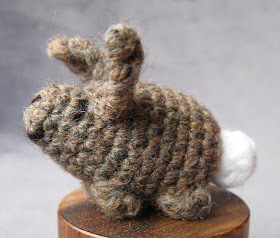 Here's a simple little pattern to crochet a tiny rabbit, about 2" long. 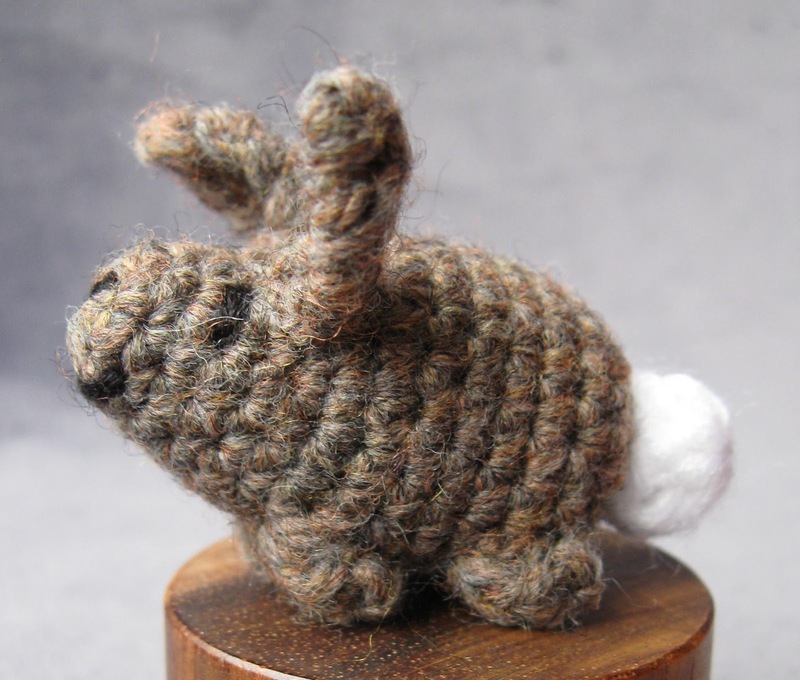 You crochet the ears and the feet as you go along, so the only sewing is for the features and the tail. Small amount of light brown yarn. Small amount of white yarn. 4 dc pop: popcorn stitch for legs. Work 4 dc into 1 st, take hook out leaving loop, put hook through 1st dc & pull loop through. Start at nose using light brown yarn. Round 1: Ch2, work 6 sc into 1st ch - 6 st. Round 2: [2 sc in next st, sc in next 2 st] 2 times – 8 st. Round 3: Sc in each st around - 8 st. Round 4: [2 sc in next st, sc in next st] 4 times – 12 st. Round 5: Sc in next 4 st, [ear: ss in next st, ch 6, sc into 2nd ch from hook, dc in next 3 ch, sc in next ch, ss back into original st], sc in next 2 st, [ear: as before], sc in next 4 st – 12 st. Round 6: Sc in each st around (work into the first ss of the ears, not the second) - 12 st. Round 7: Sc in next 4 st, [2 sc in next st, sc in next st] 3 times, sc in next 2 st – 15 st. Round 8: Sc in next 4 st, [2 sc in next st, sc in next 2 st] 3 times, sc in next 2 st – 18 st. Round 9: 4 dc pop in next st, sc in next st, 4 dc pop in next st, sc in next 15 st – 18 st. Round 10 - 11: (2 rounds) Sc in each st around - 18 st. Round 12: Sc in next 17 st, 4 dc pop in next st – 18 st. Round 13: Sc in next 4 st, 4 dc pop in next st, sc in next 13 st – 18 st. Round 14: Sc in each st around - 18 st. Round 15: [Sc2tog, sc in next st] 6 times – 12 st. Round 16: [Sc2tog] 6 times – 6 st.
FO, leaving a length of yarn. 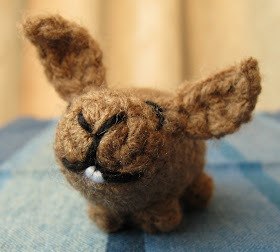 Use black yarn to sew eyes, nose and mouth, stuff and use length of light brown yarn to sew up hole at bottom. Ch 3, work 6 dc into 1st ch, join to first dc with ss. FO leaving a length of yarn and sew to bottom. Use the length of white yarn to sew front teeth if you wish. What a cute little guy! Thank you! LOVE IT! Thanks for sharing this pattern! I have also been making cork knights like crazy lately. Thank you! 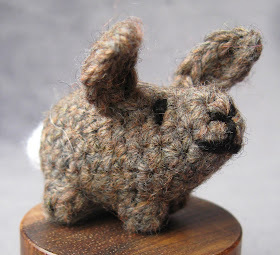 I think it looks even cuter in real life - it's hard to photograph something that small. Erica - have you got an army yet? They look really cool all together. Just curious but are you planning on a grey Totoro pattern? I notice on your LJ that you have patterns for the white and blue Totoro but I'd love to make a complete set! I would like to make a grey Totoro, but perhaps not to scale with the others! The trouble is that other projects keep turning up, but I will try. Your rabbits look really cute all together especially in their little basket! Thank you! Have fun making them. I must admit, embroidering features is often the hardest part of making an amigurumi. I would stuff the face, so you can see the shape better, then take the black yarn through the hole at the end. The bottom of the nose is in the middle of the first round, so that makes it easier to see where to sew. After you've done the face, finish stuffing, sew up the bottom, and then sew the tail on. If you want, you can use a bit of the white yarn to sew the teeth. I hope that helps! Thank you for posting pattern I just made one in white and now will make some more. I am going to tie a ribbon around their neck as Easter gifts . Cute! That sounds like a really good idea. I just made one and it is so cute! Thank you for this adorable pattern! I now have a herd!!! Thank you again! Thanks! I'd love to see them. I'm not sure how to do this, but maybe this will work. It's a pic on my FB page. Cute! I rather like the black one. I would like to show some of them in my blog www.kleinene.de and I also would like to set a link to your page for the tutorial. Is that o.k. for you? That would be fine Steffi, I'd love to see them. Thank you Steffi, your rabbits look really cute! I'll add a link to your translation to this post and to Ravelry.